Hold the Shift key and choose Edit | Advanced Preferences to open the Advanced Preferences dialog box. This dialog box controls advanced settings that determine how Sketchpad works. Change these settings only after careful consideration; most users never need to modify them or need to modify them only once. Holding the Shift key changes the Preferences command to Advanced Preferences. 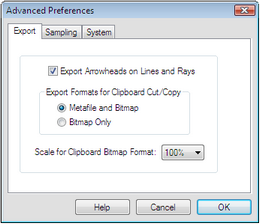 The Advanced Preferences dialog box includes three panels: Export, Sampling, and System.